Autumn is my absolute favourite season. There's something special about crisp sunny days with a slight chill in the air. Some people see it as sad because the leaves finally fall from the trees, but (provided it doesn't continue to rain buckets), there are piles of shiny brown leaves, just ripe for kicking. I have been waiting for Miss A to reach two (and a bit now) just so that I can use her as an excuse for skipping through leaves, looking for shiny brown conkers. One day, I'd love to holiday in New England in the fall. I've had several failed attempts at getting there in the past but it's on my (overly long) holiday bucket list and I'm determined to make it there one of these days. The other good thing about September 1st is that it heralds the start of soup making season. I love soup and could quite happily live off of it most days - provided it was interspersed with lots of toast. There's just something comforting about a piping hot bowl of soup that takes me right back to my childhood. My mum was forever making soup when I was a child. I think back then I really only liked it because it came with deep fried croutons but as an adult, it takes me right back to the tiny kitchen where I grew up. My favourite was Mum's cream of cauliflower, closely followed by my Grandma's minestrone. I still cook both of these regularly but don't really expand my repertoire past that. 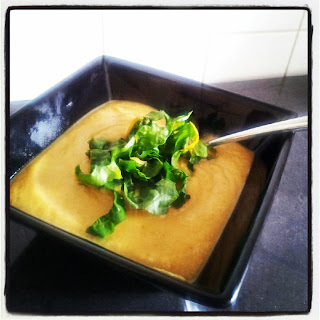 I've made a few soups (this is #14) during the course of this blog and whilst they were all very acceptable, none of them really made me want to make them again in preference to the default two. However, today, I may finally have come up with a contender. I happened across the Soup Tuesday blog some time ago. It's written by husband and wife team Dan and Kasari. It's not just about Soup and not just written on Tuesday. It's about cake too (this is how I found it as Kasari entered the Weekly Bake Off one week when I was judging it) and lots of other things as well. Dan then participated in the Olympic Food Challenge, putting us all to shame by really pushing the limits of the game by eating Deep Fried Duck Tongues. They're a great pair and if you're on Twitter, you should definitely follow them for their entertaining musings. Anyhoo, this week, Dan blogged about the cauliflower soup and I knew I just had to try it. So yesterday, I dropped in on one of our local farm shops to get the ingredients I needed and this morning, set about making the soup. It's dead easy - just roast the veg, simmer it in stock and then blend. What I liked about the method was that by using a potato, there was no need for the faffy making of roux sauce that accompanies my mother's cauliflower soup recipe. In fact, next time I make hers, I may try potatoes rather than white sauce to see what a difference it makes. With the subtle Indian spicing and the aromatic coconut flavour, I really enjoyed this soup and will definitely be making it again. As I only had creamed coconut, I substituted this for the coconut milk along with a little regular milk although when I served the soup it was still pretty thick. My chard wouldn't wilt either but the texture wasn't a problem. My soup was also slightly less piccalilli-like in colour than Dan's because I didn't time how long I roasted my vegetables for and they were a little more brown than 'golden around the edges' but thankfully not burnt (just about) and it still tasted good. You can find the recipe here, along lots of other recipes too.